On the occasion of the screening of “Father” at the Taiwan Film Festival UK, we talked with him about Budaixi, Master Chen’s feelings, the changes a documentary can initiate, the South Pole and other topics. First of all can you tell us how you got to start this 10-year project? 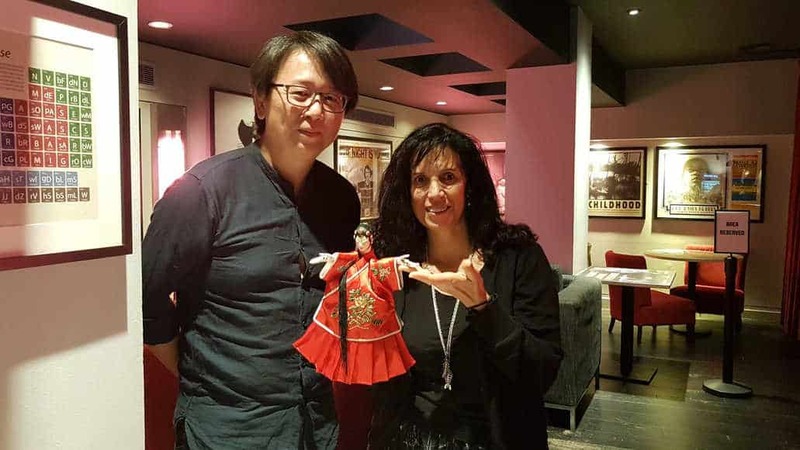 I am 50 years old now and 12 years ago, one of my friends working in TV, who knew that Budaixi puppetry was very important in my life, told me he wanted to bring to me this master, Master Chen. This was the first time I was able to see a live puppetry performance right in front of my eyes. I was thrilled, I could not believe how detailed it could be, because the puppets don’t have any facial expressions, but those gestures could really tell their emotions. Yes, in the wordless performance at the end of the movie you can really see that! Can you believe that when this film was about to be released in the theatre, there was a marketing expert who told me, “Can you please cut off these 20 minutes?” I felt that this was crazy, I did not know if I had the problem or if they had the problem. Why? Because there was no dialogue? The reason was that in the current Taiwanese society nobody wants to watch Budaixi anymore, so the marketing expert suggested that I should cut this part and focus on the relationship between father and son. I said “it is because no one wants to watch it and no one knows anything about it anymore, that is why I want to show it!” I was really glad I did not cut this scene, because Master Chen right now has this thyroid and sometimes his hands are shaking. Right now, he cannot perform as well as you see in the film. So, when I saw this performance for the first time, I felt that I needed to preserve it and to document what I just saw. In a short time, I may not be able to shoot these scenes of this beautiful art any more. I know the techniques are just the surface of this film, but how to make this art survive and carry on, is the blood and flesh of this film. In Taiwan, there isn’t anyone who wants to learn Budaixi from Master Chen, but there are many people from France, Italy who want to visit and learn something from him. It is very sarcastic; I need to document these events. I was recording all these foreigners coming to Master Chen for this purpose, but then I quickly discovered that the problems on the relationship between father and son are the soul of this film. That is why it took me six years after finishing filming these techniques to find the right angle to show the relationship between father and son. In Taiwanese society, we don’t allow the son to question or rebel against the father. When this film was released on cinema, there was this Dutch man and was actually a disciple of Li Tien-lu, Master Chen’s father. This Dutch man told me a story. When he came to Taiwan 30 years ago to learn the traditional puppetry from Master Chen’s father Li Tien-lu, he actually met Master Chen who at the time, was around 50 years old. This Dutch man actually performed in front of me, that when he was standing next to Li Tien-lu, he saw this 50-year old master Chen shivering and afraid to come closer to them and said to his father, “Can you give me some allowance?” and then his father took out the cash from his pocket and gave it to him. Master Chen did not look at his father, just took the money and walked backwards. The Dutchman could not believe what he was seeing, and that triggered in him the curiosity to discover what the relationship between father and son is in Taiwanese society. During this long process, what was the biggest obstacle to overcome and what was the part that gave you more joy? The thing I enjoyed the most was the fact that I managed to record Master Chen’s techniques when he was at his top form. We shot so many sequences of these techniques that now, actually, after this documentary film, we started archiving the videos of his performances and then we put it on YouTube and made something like a tutorial, for teachers in elementary schools to show the kids and also their parents that we have this national treasure. That is what made me most happy. And also asking Master Chen to talk about his father. The only time I could ask him to talk about him was when he was in the studio the last time. Actually, Master Chen said nothing for a while but I know when there is no answer, the silence actually explains everything and that is the answer. For me to illustrate this in the film was the most difficult part. From the movie, we understand that the government doesn’t allow much funding for Budaixi and I was wondering if it’s the same for all the other traditional forms of art and performance. It is not just Budaixi, but also the traditional Taiwanese opera and the theatres all suffer from low funding. The Taiwanese government does not care; it is not as if they do not want to preserve them, but all they want to do is to put them into museums. I think that this kind of performance should exist in daily life, when it goes to the museums it just becomes an object to watch. However, to preserve them in real life is actually very difficult. The Taiwanese government does not know what to do with these traditional arts except from putting them into the museums. However, when this film was screened in cinemas, it actually influenced the policy of the Ministry of Culture. So now, they are putting more funds towards the generation that are still performing Budaixi in Taiwan. But for me, the most incredible thing is actually the support of the people, so now there are some corporations approaching me and saying, “Director, this should be shown in every elementary school in Taiwan and we are willing to pay for the costs”. So, I think I don’t want to depend on government funding to preserve our culture; museums are not the only way to preserve our culture. I know you are an established documentary director in Taiwan and your works revolve around family bonds, youth, old age. I am very curious to know if your next project will be still in that area of interest. I just had lunch with Tsai Ming-liang. We’ve been known each other for a long time. I just came back from South Pole because I am shooting a documentary about South Pole and I was asking Tsai Ming-liang, if it was him, what would he do, and how would he express and present the South Pole? He did not answer me that, of course, but he told me in the past decade what works have changed and transformed. The reason I wanted to ask him this question is because I was curious and I was thinking I’m open to use events to tell the story, but I wanted his opinion on it, if I could use pure visuals to tell the story. South Pole actually offered an important and rare chance to experiment with this approach. But you asked me about my next film. There is actually a movie I have been filming for a long long time. Since 1994, I started shooting seven boys who, at the time, were 15 years old, and following how they grew up. Now they are in their forties and I deal with their seven stories. The topic of the film is youth and it will be a very important film for me. However, it is very difficult actually, because the film represents how the digital camera was brought in cinema, you can see the transformation of the images, so there is different quality from the beginning till now. Because we have a different way to express it, for example I will make the same person when he was 19 year-old to meet his 38 year-old self, in the same frame. I will need to use some special effects to make them meet each other and you will be able to tell they are the same person.